MANILA, Philippines – The Philippines' Department of Foreign Affairs (DFA) and the US' Equal Employment Opportunity Commission (EEOC) signed a memorandum of agreement on February 13 to provide better protections for Filipinos working in the United States. This is the 4th migrant worker related MOU signed between the PH and the US. 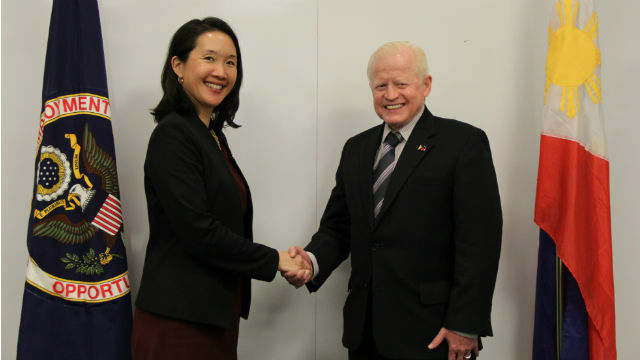 "We are pleased at being able to formalize our alliance with the EEOC and collaborate closely towards ensuring that Filipino nationals working in the US are accorded equal opportunities at their workplace," Philippine Ambassador to the US Jose Cuisia Jr said. EOCC chair Jenny Yang emphasized the "invaluable contribution" of Filipinos to American society and the US workforce and reiterated the EEOC's commitment to uphold the rights of migrant workers. Yang said EEOC estimates place the number of Filipino immigrant workers in the US at more than one million. But an estimated total of 3 million Filipinos – migrants, permanent residents and naturalized US citizens – live in the United States. She said Filipinos not only comprise one of the largest immigrant groups but also have a high rate of participation in the labor force compared to other groups. “By signing this MOU today, the Commission signals its unwavering commitment to justice and equality in the workplace for individuals of Filipino descent whose efforts and contributions have been invaluable to American society and the US workforce,” said Yang. Cuisia said the MOU with the EEOC is an "affirmation" of the US government's advocacy for equal opportunities in the workplace and prohibited workplace discrimination.